SaaS applications have become an essential part of our everyday life and yet do not have a fool-proof mechanism against data loss. The need for backup arises out of various causes like regulatory compliances and data loss from accidental file deletion to rogue applications. Vembu SaaSBackup delivers what you need exactly by offering backup of applications like Microsoft Office365 and Google Apps (now G Suite). It is designed to protect your applications from all possibilities of data threat by backing up emails, calendars, contacts, and drives efficiently with backup and restore operations as per your request. Vembu SaaSBackup is designed to backup entire Google Apps (now G Suite) and Microsoft Office 365 accounts. 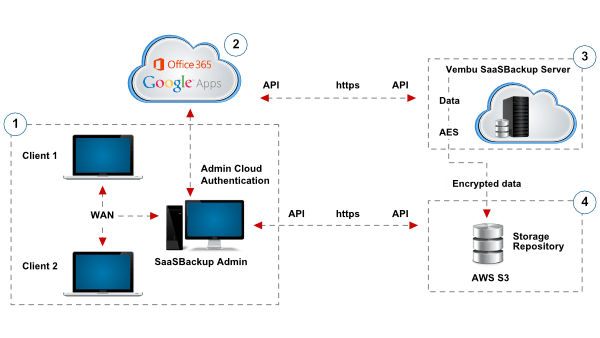 Vembu SaaSBackup uses advanced REST APIs to backup Office 365 and G Suite Apps. You don’t need to install any client side software on your machine for backup. Simply, create a SaaSBackup customer portal account and manage all the backup and recovery of your Saas applications. Vembu SaaSBackup is hosted in a very secure AWS cloud. You can login from anywhere with your SaaSBackup credentials, and configure & monitor backup jobs and perform recovery. Vembu SaaSBackup uses AES 256 encryption algorithm. Data is secured while transferring the backup data over WAN and while storing the backed up data at storage repositories. Vembu SaaSBackup proves to be user friendly with a simple user interface for an effortless backup and recovery process. You can get the basic information of the backup from the dashboard page. Vembu SaaSBackup delivers extensive reports on G Suite and Office 365 backup jobs which keeps you informed about the time taken for each job to the size of the backup before compression.